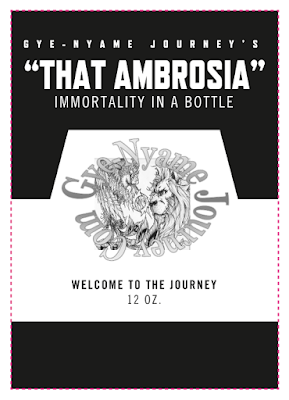 Gye-Nyame Journey: "That Lemon Lime & Ginger Ambrosia"
"That Lemon Lime & Ginger Ambrosia"
"That Ambrosia" is a drink that was created for those on the Journey. I felt that we were in need of something to replace the unhealthy sugar drinks that we are consuming. "That Ambrosia" is a live beverage that helps you with gut health. It provides healthy yeast and bacteria that are involved in an alchemical process of fermentation. They transform the ingredients of raw unpasturized honey, and green tea into an elixir that is tasty as well as good for you. All three of these would be powerful enough to do solo drinks but I figured we needed to pile it on, plus these three work well together. Lemon and lime are very similar, they both bring vitamin C into the game which helps to get your immune system fired up, but between them they have been said to aid in digestion, they both help clean the system, they help clear up skin ailments, and help to get rid of unneeded pounds. Because they help clean out the system they are given credit for aiding with many of the ailments above. They are the "Wonder Woman & Superman" of this health Justice League. The "Batman" is the ginger. the ginger also helps with digestion, but the reason that I added it to this combination is because ginger is known for helping speed up the blood flow, and cause what ever you are using with it work in the body faster. This is why you sometimes begin to sweat when you eat ginger. This also is how it helps to clean out the body.